Fake IP news isn’t news. 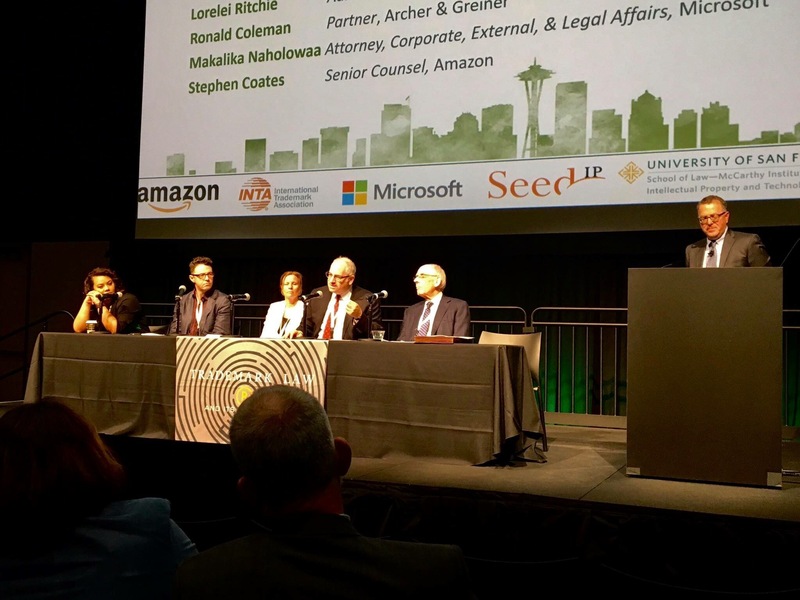 For years I’ve been expressing skepticism about the constant drumbeat by Big IP, its enablers and its vendors about the ridiculous figures bandied about as “the annual cost of IP theft.” I’m not in favor of IP theft; not at all. But it shouldn’t be necessary to lie about it to make the point that’s it bad. At least the government wouldn’t lie about stuff like that, though, right? Not at all. It did, and almost certainly still does. Although at least it kind of admits it. To make the propaganda plot seem more legitimate, the State Department is trying to enlist Stanford Law School and “similar academic institutions” to play along on the @StateDept feed on Twitter. “We’re not going to participate,” [Lemley] told Ars in an e-mail. He recently received an e-mail (PDF) and a telephone call from the State Department seeking his assistance. 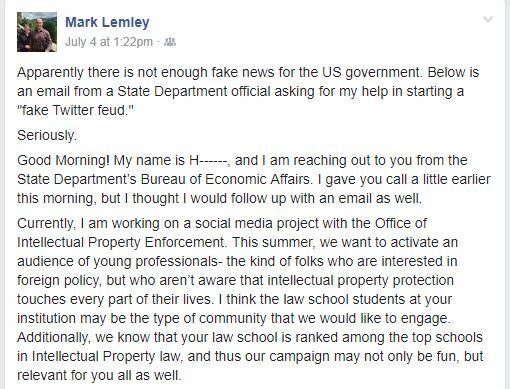 “Apparently there is not enough fake news for the US government,” Lemley told his Facebook followers. On the Facebook post, he redacted the name of the official who sent him the letter out of privacy interests. The RIAA declined comment, as did the trademark office. The MPAA said it is not participating. Everything about this is crazy. First, the State Dept. should not be creating fake news or fake Twitter feuds. Second, even if it were to do so, it seems to have picked one side of the debate, arguing that greater copyright and patent enforcement is obviously a good thing (how far we’ve come from the time when it was the State Department that fought back against SOPA and told the White House not to support it). Separate from that, why are the MPAA, the RIAA and the Copyright Alliance agreeing to team up with the US government to create fake stories? That seems… really, really wrong. I get that they are obsessed with always pushing a misleading and one-sided message on copyright law, but creating out and out propaganda with the US government? The only bright side about this is that the Foggy Bottom people were so naive about what’s wrong with this — “Who doesn’t like ice cream? Let’s do a show about ice cream!” — that in recruiting what they assumed were high-value IP figures (you know, famous ones — trailblazer types!) they openly approached one of the people on earth least likely to play along and most likely to do exactly what he did. Didn’t they used to know you don’t tell your recruits what they’ll be doing until AFTER you know they’ll play along?